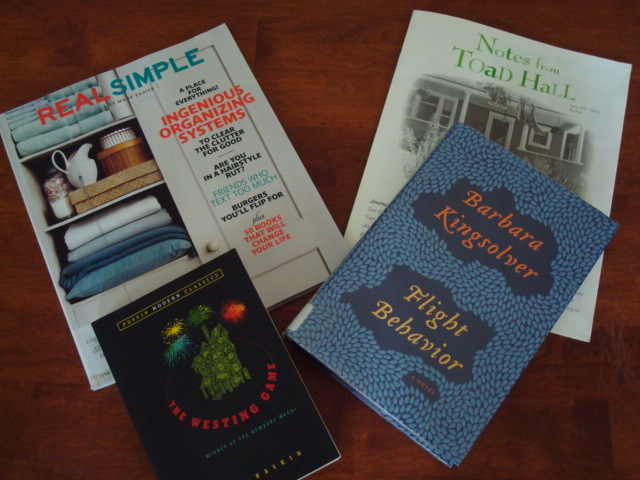 Flight Behavior by Barbara Kingsolver. I finished this book on Mother’s Day. The novel is set in a small town somewhere in Appalachia. A young woman discovers hundreds of thousands of King Billies (butterflies) hanging out in the mountains near her home. This is an ominous sign. The butterflies should be in a different climate during the winter months and this occurrence sets in motion the plotline. However, there are many other subplots that shape the novel—faith vs. science, poverty, marriage and family life, to name a few. To be honest, I started skimming the novel starting at the two-thirds mark. I love the strong female characters and the beautiful writing that Kingsolver creates, but I tire of seeing the same soapboxes appear in her novels. Yes, the environment is a concern and yes, some Christians turn a blind eye to caring for creation and are downright irritating to be around, but not all! My hope is that Kingsolver meets a thoughtful, intelligent, and winsome Christian someday who cares about the environment and loves science. Perhaps they can have a meaningful conversation. Real Simple—June issue. This magazine was also Mother’s Day reading. Knowing I would have a leisurely morning while Brad and the kids fixed breakfast, I enjoyed this issue in bed. What caught my attention was the article “50 Books that Will Change Your Life.” I was intrigued to see what would make the list. According to Real Simple, “renowned authors from every genre” named the titles that “moved them most.” The small descriptions about each book are helpful and I love that on the back page of the magazine is a handy tear-off, listing the book titles. The next time I head to the library I can tuck this list in my purse. The timing of this issue is also helpful as summer approaches and I, like many others, find more time for leisurely reading. Notes from Toad Hall—Issue #2, Spring. Few pieces of mail elicit such a happy response in me. Whenever a new issue arrives, I know I am in for a treat. This issue was no exception. Margie writes about experiencing a “heaviness of spirit” even while Denis and she are away at a cabin enjoying some time off. Haven’t we all experienced this? How does one live well when life lacks joy? Or the dailyness of our routines and tasks make us feel dull and discouraged? If you don’t receive Notes from Toad Hall, you can read this issue online (www.ransomfellowship.org). Notes is not all heaviness, though. You will laugh at Margie’s description of her sabotaged writing morning at the coffee shop. The Westing Game by Ellen Raskins—I wanted to read this young-adult book for some time and finally did. In fact, I added it to my summer choice book list for my rising seventh graders (incoming seventh graders have to read two required books and one choice book at Stony Brook). The book also won the Newbery Medal in 1979. If you like mysteries and following clues, you will like this book. Sam Westing, an eccentric man, dies and his sixteen heirs receive clues regarding his death and the identity of the killer. See if you can figure out who the killer is before the end of the book! My bedside table needs refilling. Perhaps I will head to the library today with my “50 Books that Will Change my Life” list and see what I can find. What’s on your bedside table? Oh, both good books. I just checked out Home Economics (Berry) from the library. It is a collection of his essays that I have wanted to read for a while. I love the westing game! I’m working on Sherlock Holmes stuff right now. Got ‘the complete works’ off amazon for kindle for free. And, of course, all the e-books from the Ultimate Homemaking E-Book Bundle — all about homekeeping, getting dressed each day, happy and healthy children and a slew of other topics for those in the homekeeping business. Glad to hear another endorsement for The Westing Game!